Tickets €23.00 on sale now. 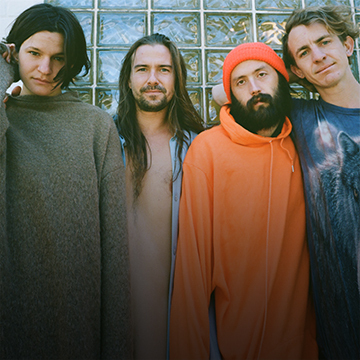 Aiken Promotions proudly presents Big Thief live at Vicar Street, 21st May 2019. Tickets €23.00 on sale now. Brooklyn’s Big Thief -- Adrianne Lenker (guitar, vocals), Buck Meek (guitar), Max Oleartchik (bass), and James Krivchenia (drums) – released their album Capacity back in June last year. Capacity was recorded in a snowy winter nest in upstate New York at Outlier Studio with producer Andrew Sarlo. The album jumps right into lives marked up and nipped in surprisingly swift fashion. They are peopled and unpeopled, spooked and soothed, regenerating back into a state where they can once again be vulner- able. Lenker’s songs introduce us to a gallery of multifacted women and deal with the complicated matters of identity — at once dangerous and curious, though never unbeliev- able. Lenker shows us the gentle side of being ripped open. Tricked into love, done in and then witnessing the second act of pulling oneself back together to prepare for it to all happen again, but this time to a sturdier soul, one who is going to take the punches better than ever before and deal some jabs and roundhouses of their own.